Nomos may be one of the younger players in the watch scene, but they’ve already well and truly stamped their mark on the industry. A very minimalist-looking one, to be sure, but that does not mean that their purist Bauhaus/Deutscher Werkbund-inspired designs are boring. Far from it. 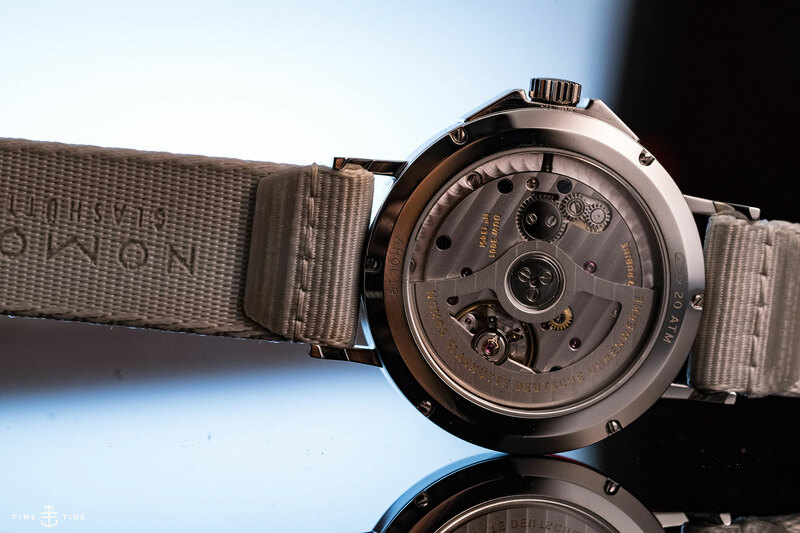 There’s nothing ho-hum about a manufacturer who has been making its own movements since 2005, and whose latest calibre – the DUW 3001 – not only uses their own designed and built escapement system but is also their thinnest automatic movement yet. Now that excitement of thin in-house goodness is combined with an extra visual punch on the outside, as they’ve added not just a splash but an entire bucket of colour to the Ahoi collection with the introduction of two new ‘Aqua’ colourways – signalblau (siren blue) and signalrot (siren red). We’re already familiar with the silvery-white and Atlantic-blue dials of the sporty Ahoi, and while – at the risk of contradicting my earlier self – they were safe and rather plain choices, these new dial colours add a couple of vibrant, fresh faces to the collection. I know what you’re thinking: “Bauhaus designers don’t do bright colours… do they?” Well, while the vast majority of offerings from Nomos and other ‘school of Bauhaus-inspired’ watches do go a more monochromatic route, the students (and teachers) of the school actually used plenty of colour in their work. Don’t believe me? See Wassily Kandinsky. If a class in art history isn’t for you, it’s not just the colour of the dial that has been updated. If you look a little closer, you’ll see that extra little orange word – neomatik – a clear signal (if you’ll pardon the pun), that the DUW 3001 is ticking away behind that lurid dial. And at only 3.2mm high, this admirably accurate movement is a drawcard in its own right. The thinness of the movement also translates to a slimmer stainless-steel case, which now measures 36.3mm across and 9.55mm thick – down from 40mm and 10.64mm. 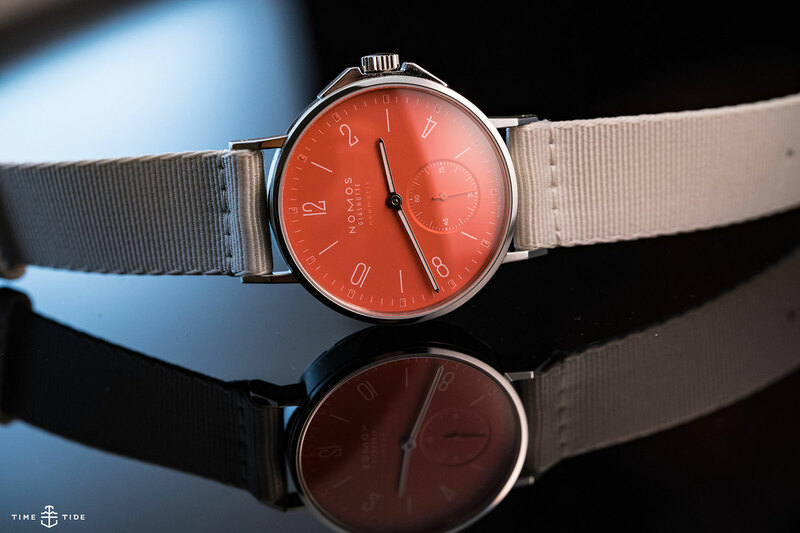 However, as with most Nomos watches, the Ahoi Aqua wears a little larger – closer to 38mm – thanks to its long arched lugs, crown guards and flat case. 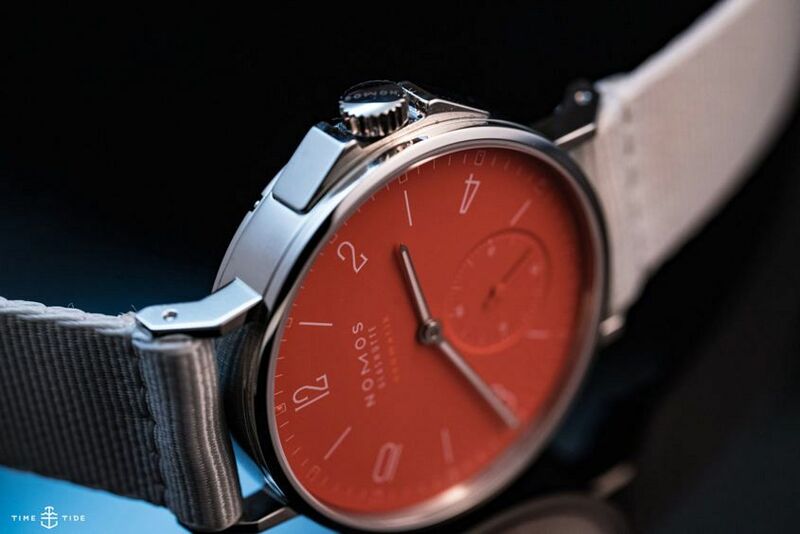 Of course, being that the Ahoi is Nomos’ elegantly rugged sports watch, the Aqua neomatik maintains the same 200 metres of water resistance, has lume-filled hour markers and hands, and comes on a hard-wearing woven textile strap – similar to a two-piece NATO, and not the Perlon-style strap they’ve previously used – which is available in blue-black or light grey. 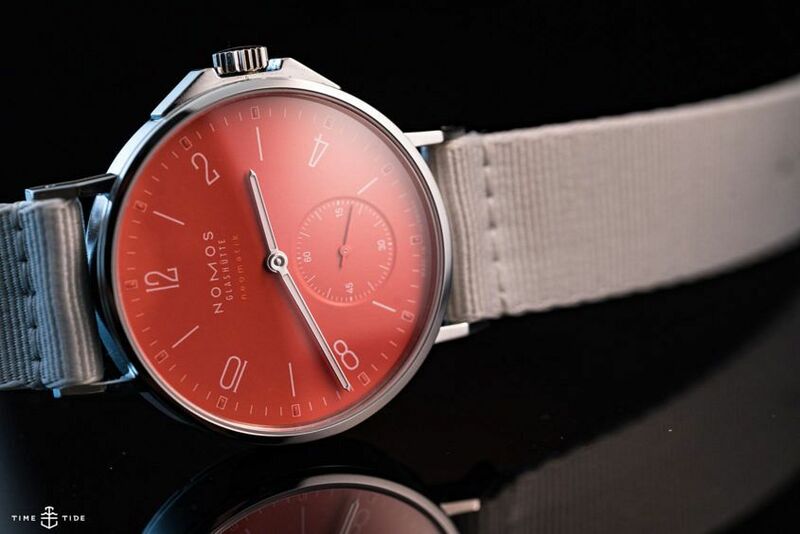 As cool on the outside as they are on the inside, these new Nomos Ahoi neomatiks bring even more heat to the wrist, and just in time for summer.